"YOU'RE brave coming out in this weather." Just about every stallholder we came across at Eumundi Square greeted us with the same comment this cold, wet and miserable day. But they didn't know just how determined three mums could be. We had found ourselves in the renowned markets town early on a Sunday morning. Of course, every Sunshine Coaster knows that Saturday and Wednesday are the two big days of the week in this hinterland hub. On those days, the entire town is embraced by thousands of shoppers from all over the world browsing more than 500 stalls of the Original Eumundi Markets and Eumundi Square stalls, plus galleries and shops on the main street and down alleyways. Public carparks and car spaces on Memorial Drive and surrounding neighbourhood are at a premium, buskers' voices or instrumentals can be heard around every corner, Joe's Waterhole is providing lunchtime ales and a place to rest tired feet, and cafes and restaurants do a roaring trade in cappuccinos and lattes, bruschettas and raisin toast. But with work schedules and busy lives, this was the only day the three of us could find completely free in our diaries. Even a change of scenery is as good as a holiday to us. So rain or no rain, markets or no markets, we were having a girls' day out. And we were determined to pack in as much fun as three mums could muster in eight hours. Parking virtually right outside the historic Eumundi Trading Post building, we took our first coffee of the day in the warm of Berkelouw Book Barn and Cafe - a place to get lost in words, worlds and wonder but where a taste of reality lies in the enormous Anzac biscuits and other menu treats. With still half-an-hour before the Eumundi Square shops opened, we wandered up deserted Memorial Drive to Food@Eumundi, which was enjoying a brisk breakfast trade despite the cold conditions. There, more coffees and croissants or turkish bread with homemade jam hit the spot. And as the rain poured down outside the outdoor "gazebo", protected by clear plastic walls, we caught up on all the gossip of the week. But money was burning a hole in our pockets, and Eumundi Square was only a stone's throw away. There, visitors will find 90 permanent micro-businesses offering a diverse selection of goods including clothing, tableware, design accessories, art, chocolates and cakes. So with a break in the rain, we wandered down for a two-and-a-half-hour bargain hunt - roaming amid African artwork and woodwork, and immersing ourselves in colourful kaftans and leather handbags, funky jewellery and even shoes with interchangeable tops. But the real reason for our trip north from our Kawana Waters homes still lay ahead. 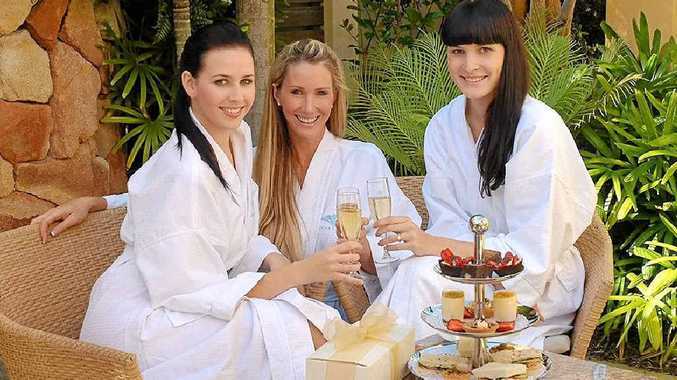 We had conspired together to ensure our families took advantage of a special Mother's Day offer at Noosa Springs Spa and Resort. And with six months to use the vouchers we received, we were able to plan our big day well in advance. So next stop was the resort's restaurant, Relish, for a leisurely lunch of Mooloolaba Prawns linguini (my favourite! - with garlic, chilli, cherry tomatoes, preserved lemon, basil, spinach, and extra virgin olive oil), Crispy Bangalow pork belly (chilli jam, coconut prawns, fried shallots and coriander), moreish Moroccan lamb pizza, and a toasted pide (chargrilled rib fillet, bacon, caramelised onion, beetroot relish, tomato, rocket and cheddar, served with chips and aioli). Though the rain bucketed down outside, we were warm and dry with a glorious view across the restaurant's Mediterranean-style veranda to the golf course. That would be enough for most people, but the day's climax began the moment we headed up the stairs to the spa. Like most mums with teenagers still living at home, we're too busy playing taxi driver, chief family chef and bottle-washer to indulge ourselves in a little luxury. For the next two-and-a-half hours, we made up for lost time. Over 40 minutes, we "self-massaged" our bodies and souls in the hydrotherapy pool amid the cascading shower, and various jets of water targeting our legs, backs, arms and bodies. Access to the sauna, steam room and blitz shower provided added degrees of therapeutic bliss before we all came together to lie back in the relaxation lounge and take refreshments of champagne and fruit skewers. Erica, my therapist, put the final zing in my day with a 50-minute facial - a combo of head, shoulders, neck, arms and hands massage by her magic fingers, complemented by warm face towels, Eminence products carefully chosen to suit my skin type, soothing music and soft lighting. Our big day out ended with a scenic drive home. I mean, really, what more could a girl want? Eumundi Square is at 1 Albert Street, Eumundi, and is open on Wednesdays and Saturdays from 8am-1pm and Sundays from 8.30am-1.30pm. The Original Eumundi Markets are at 80 Memorial Drive and operate every Wednesday and Saturday from 7.30am to 1.30pm. Food@Eumundi is at Shop 1/104 Memorial Drive. Phone 5442 7072.